Dubbed the Doctor of the Dirt when he first appeared with Rampaging Roy Slaven’s alter ego John Doyle on Sydney’s ABC 702 radio station in 1992, Angus has carved a niche as a multi media horticultural evangelist. He is an award winning horticulturist, author television presenter and broadcaster who also creates new varieties of Australian plants in his spare time. His Bush Gems kangaroo paws have been grown by the millions around the world in places as diverse as Israel, Colombia and South Korea. Angus Stewart has been a regular on the iconic Gardening Australia TV program since 2004 and has also written hundreds of magazine articles for a wide variety of titles including Gardening Australia, Belle, Better Homes and Gardens and Organic Gardener. 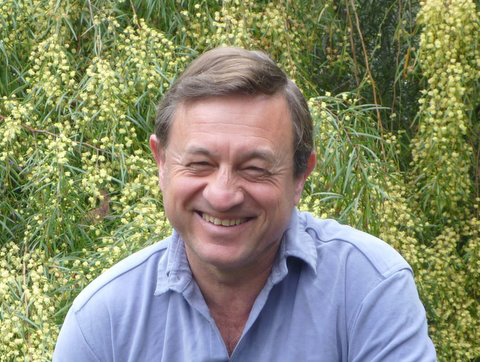 He has written a number of books on Australian plants including the award winning best seller Creating an Australian Garden. Angus is a versatile and humorous speaker who can both entertain and inform about all things horticultural. Is organic gardening a con job? For further information contact peter@wallmedia.com.au.